In this example, we give an overview of the sklearn.compose.TransformedTargetRegressor. Two examples illustrate the benefit of transforming the targets before learning a linear regression model. The first example uses synthetic data while the second example is based on the Boston housing data set. A synthetic random regression problem is generated. The targets y are modified by: (i) translating all targets such that all entries are non-negative and (ii) applying an exponential function to obtain non-linear targets which cannot be fitted using a simple linear model. Therefore, a logarithmic ( np.log1p ) and an exponential function ( np.expm1 ) will be used to transform the targets before training a linear regression model and using it for prediction. The following illustrate the probability density functions of the target before and after applying the logarithmic functions. At first, a linear model will be applied on the original targets. 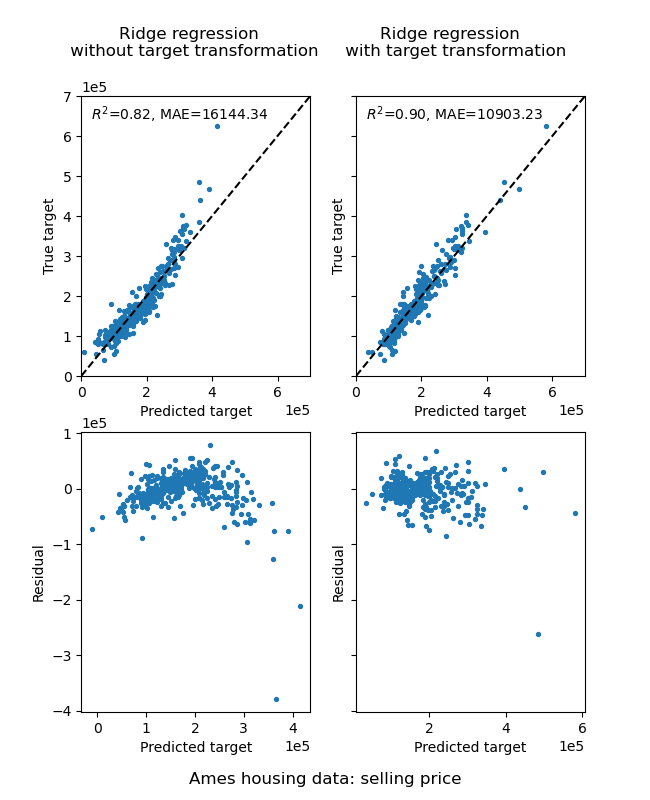 Due to the non-linearity, the model trained will not be precise during the prediction. 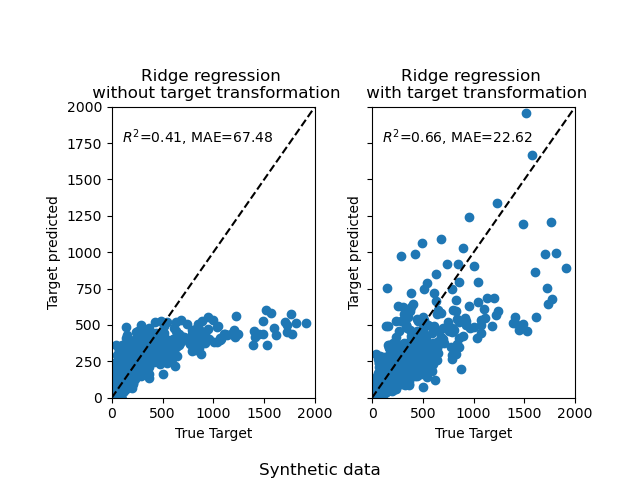 Subsequently, a logarithmic function is used to linearize the targets, allowing better prediction even with a similar linear model as reported by the median absolute error (MAE). 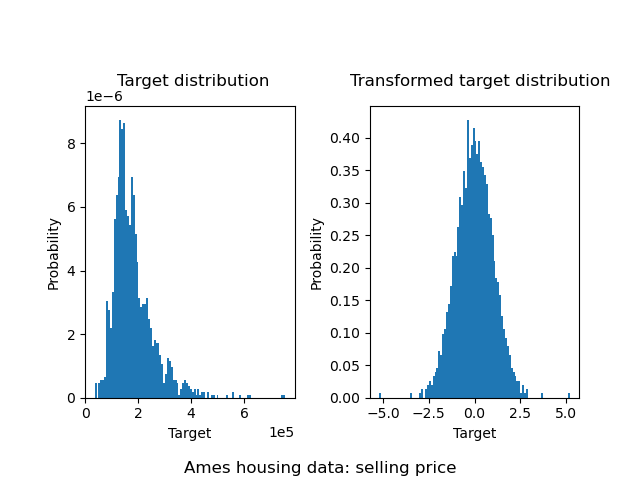 In a similar manner, the boston housing data set is used to show the impact of transforming the targets before learning a model. In this example, the targets to be predicted corresponds to the weighted distances to the five Boston employment centers. 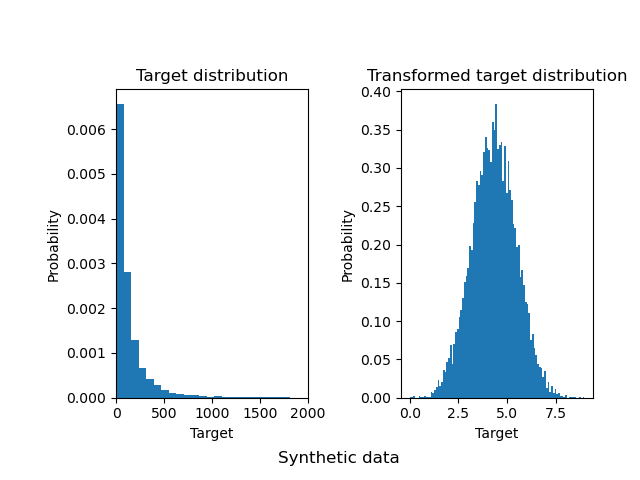 target = np.array(dataset.feature_names) == "DIS"
A sklearn.preprocessing.QuantileTransformer is used such that the targets follows a normal distribution before applying a sklearn.linear_model.RidgeCV model. The effect of the transformer is weaker than on the synthetic data. However, the transform induces a decrease of the MAE.